Summertime is in the air—along with graduation caps at high schools and colleges all over the country. Not to mention kindergartens and graduate schools, too! 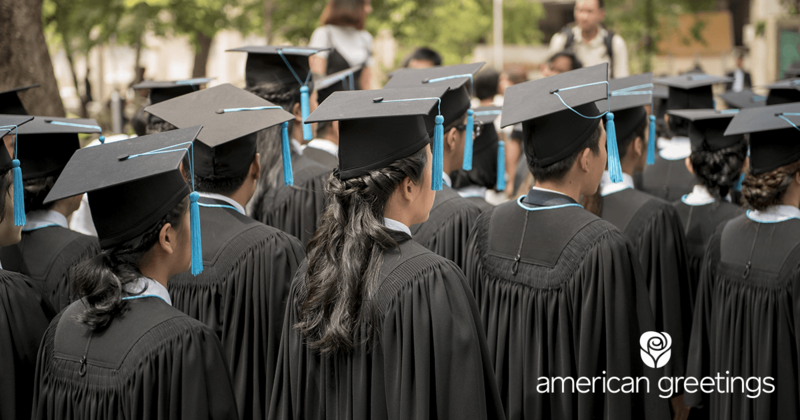 It really is an exciting time for graduates of all levels—which means with graduation season come announcements in your mailbox, invitations on your calendar, and graduation cards on your shopping list. So, once you find the perfect card for your proud grad, how do you come up with what to write in a graduation card? No worries. We’ve got your back. Here are some suggestions and thought starters to get your wheels turning. Just take a look at the ideas below and then formulate the one you like best to match your grad. Keep them in mind the whole time and you won’t go wrong. You have so much to offer (Name). Wishing you a most beautiful future! You worked hard to get here—and from today forward, anything is possible! You did it. Way to go! Success is yours. This is just the beginning of the incredible things you can do. Congratulations! You have what it takes to do truly wonderful things. Congratulations! The world is waiting for you, (Name)! The tassle is worth the hassle! You did it! Congrats, (Name). Hey grad, hope you know how relieved we are for you. Way to go! One degree equals two happy parents. So proud of you, honey! So, you see, writing graduation card messages don’t have to be hard to compose. They just have to be sincere, thoughtful, and upbeat. No sweat, right?